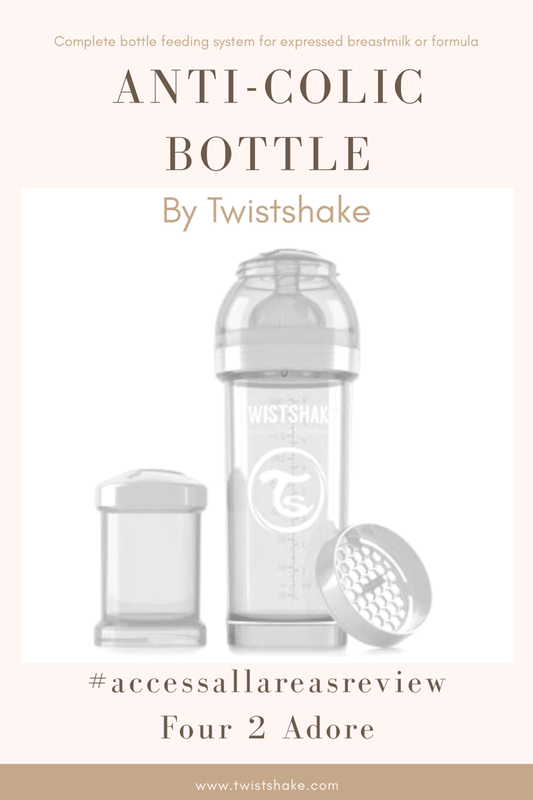 Recently I received a bottle from Twistshake to review. I’ve been trying out a few (big brand) bottles I’ve bought in local stores, without any success. I’ve been getting a bit of work and my mum has been minding Lachie; during the day I express in my break, store the milk and bring it home. Lachie hasn’t taken any milk from a bottle. He eats solids and drinks water from a sippy cup whilst I’m at work. So I’ve got quite a stockpile of EBM happening in my freezer. Thankfully, I’ve now decided to stay off work until October. Plenty of time to test out bottles! 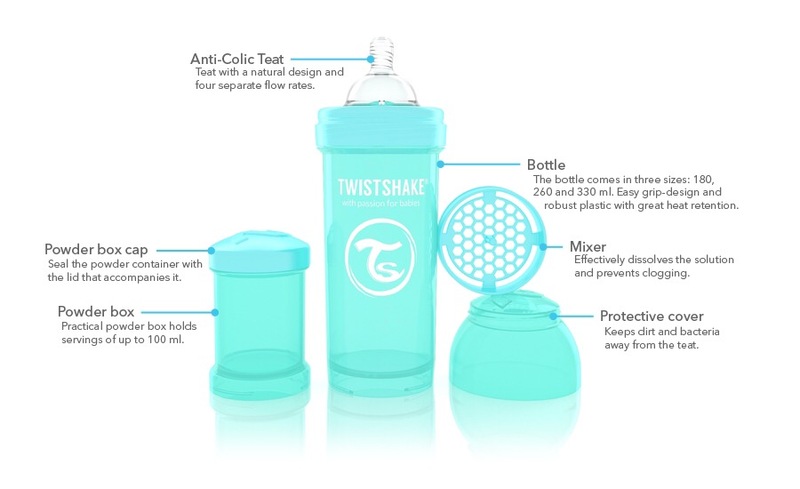 Back to the Twistshake Anti Colic Bottle. It’s a complete system so it comes with a lot more “bits” than any bottles I’ve bought so far. The bottle itself has a wide lip, which negates the need to use a bottle brush for cleaning – you can just reach in with a sponge. It is also safe to go in the top shelf of the dishwasher. 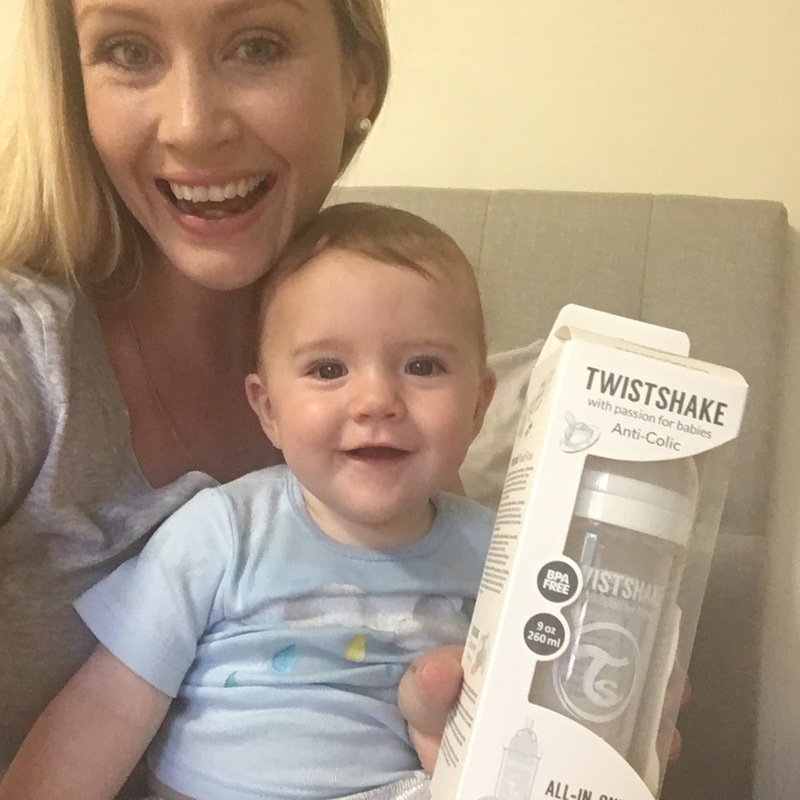 It could be used as a regular plastic cup for an older child or an infant who is able to drink from an open-faced cup (my daughter wasn’t a bottle fan either, but started drinking from a cup at around 8 months after a child health nurse suggested this as an option). Inside the main bottle, is a sieve-like mixer which helps to disperse formula powder within the water. Also included is a neat little jar-like container for storing powder. As my bub’s breastfed, I plan on using this as a snack tub for fruit or rusks. The bottle comes in three sizes. I chose the medium size, 260ml. You can also choose your teat flow rate. I went with a slowish flow (level 2), to emulate the speed of milk flow that Lachie gets when breastfeeding. The bottle is aesthetically really appealing, it comes in ten different colours. Of course, as we have come to expect, the product is totally BPA-free. Clue: he loves it 😂. Twistshake has offered a special discount to readers of Four 2 Adore! Enter FOURADORE20 at checkout for 20% off their entire range of gorgeous products for babies and kids! Next Post How adopting a puppy changed how I see my kids. My goodness would have lived this when my kids were babies. Both suffered terribly.